Should the U.S. do more for its impoverished neighbor? Haiti is among the world's poorest, least stable countries, beset by extreme unemployment, near-total deforestation, disease and chronic political unrest. After Haiti's elected president, Jean-Bertrand Aristide, was forced into exile a year ago, an interim government and United Nations peacekeepers sought to stabilize the little Caribbean nation just 650 miles from Florida. Soon afterward, a full-fledged U.N. relief effort was launched. 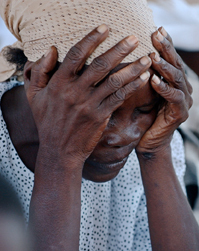 But Haiti remains torn by violence and dangerously unstable. Parliamentary and presidential elections are scheduled to be held later this year, but some political observers say Haiti is a failed state that requires nothing short of a total U.N. takeover. Others blame the United States for causing many of Haiti's problems and not doing more to help it recover. Meanwhile, human rights advocates say the Bush administration's policy of allowing fleeing Cubans into the U.S. while excluding most Haitians is blatantly unfair.